We create lighting solutions that re-vitalise the relationships between people and spaces. We eschew ice-white spotlights, which can provoke emotional disengagement, in favour of lighting that fires the imagination and lifts the spirit. We have a 360-degree business model, which means that we will personally design, manufacture and install your lights. For years, big retail has used ice-white spotlights to highlight products. However, we find that white light leads to emotional disengagement, distancing potential customers rather than drawing them in. By contrast, when we design a lighting solution we place people and their emotions at the centre of it. We develop and supply lighting solutions of every shape and size to fit any vision: the opportunities are limitless. By “optioneering” your choices we can identify the idea that you and your team love the most. Our understanding of the technical considerations frees us up to focus on the beauty of light, from the otherworldly vibrancy of hand-blown glass neons to the versatility of LEDs. Our team combines the technical and artistic competencies required to oversee every stage of your project, from conception to installation; we personally see every project through to completion. Curating, designing and installing neon signs and lighting solutions for retail displays and artistic spaces. Lumens of London was born out of a shared love for neon signs. Creating beautiful and impactful lighting installations is now our vocation. Lighting is a cognitive catalyst that can spark an emotional response and re-energise our relationship with a space or a brand. Neon light is a particularly powerful trigger. At Lumens of London, we reimagine spaces with custom-built neon installations and signage. We work for both private and commercial clients to invigorate people’s interactions with the physical spaces around them, from shop windows to office reception desks. Our marriage of artistry and practicality ensures we always deliver on time and on budget. And our passion for what we do is infectious: our clients say they love working with us. As a cognitive catalyst, lighting can completely alter our experience of a place. It facilitates sensory and emotional experiences that impact how we interact with our surroundings. At Lumens of London, we harness the power of neon lights to build lasting connections between brands and consumers. 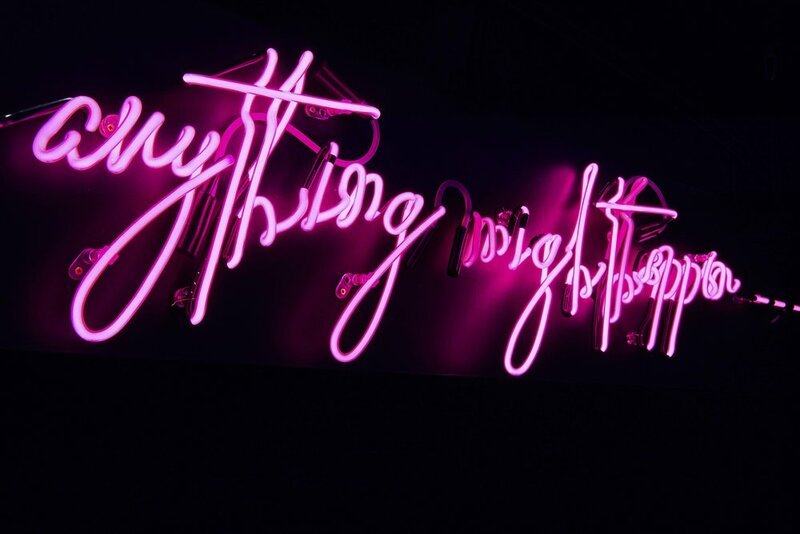 As well as partnering with retailers, creatives and visual merchandisers, we undertake private neon art commissions. Owning an original neon is a unique experience, and one that we’d like as many people as possible to enjoy. This is why we sell limited edition photographic prints of specially commissioned neon art at a more affordable price point. You can contact us using the adjacent form, alternatively call us on 07718165055 or email hello@lumensoflondon.co.uk.